Folklife Program Manager Anne Kimzey talks to 2016 Folk Arts Apprenticeship grantee and Sacred Harp singing teacher Bill Hogan. Folklife Program Manager Anne Kimzey talks to 2016 Folk Arts Apprenticeship grantee and Sacred Harp singing teacher Bill Hogan. Folk Arts Apprenticeship grants go to master artists to teach their traditional skills to students. Gina Clifford talks to Cathy Gerachis DesignAlabama board member, Cheryl Morgan retired professor of architecture at Auburn University, and Jay Lamar, Director of the Alabama Bicentennial Commission, about Connect-Livity. In this program DesignAlabama Executive Director Gina Clifford talks to Cathy Gerachis DesignAlabama board member, Cheryl Morgan retired professor of architecture at Auburn University, and Jay Lamar, Director of the Alabama Bicentennial Commission, about Connect-Livity. Connect-Livity is a series of six regional design charrettes to take place across Alabama in 2016 in association with Southern Makers' events. Southern Makers is a curated group of artisans working in various fields such as fiber arts, food, wood crafts, fashion and other focus areas. Deputy Director Barbara Edwards talks to Martha Lockett, Executive Director of Arts Revive In Selma, Alabama. Deputy Director Barbara Edwards talks to Martha Lockett, Executive Director of Arts Revive In Selma, Alabama. 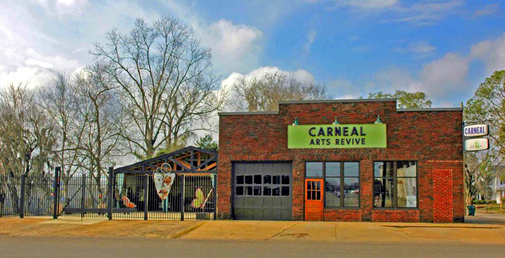 They discuss projects that Arts Revive is in the process of implementing and their success in the adaptive reuse of the old Carneal Auto Parts property on the Alabama River as their new center for arts in Selma. They talk about the ongoing phases of development of adapting other adjacent buildings into a larger arts complex.